Students returning to MIT this fall will notice that Information Systems has made several changes to the Athena computing environment, including a powerful new e-mail system, the official introduction of Redhat Athena boxes in the clusters, and a new release of Athena. MIT researchers at the Laboratory for Computer Science are among those being considered by the Justice Department to conduct an independent review of the FBI’s Carnivore Internet surveillance system. 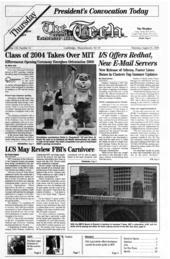 Over one thousand freshmen arrived at MIT yesterday, marking the official start of Orientation 2000. At least you won’t have to worry about nickels and dimes anymore: when the Massachusetts Bay Transportation Authority (MBTA) rate hike goes into effect on September 18, 2000, dollars and quarters will be all you need to ride the T.